Data validation based on scalar checking occupies an intermediate position in the data validation hierarchy; data must be time tagged and ephemeris information computed, but an attitude estimate is not required. Scalar checking tests the self-consistency of attitude data and is used to remove or correct spurious data prior to the Actual attitude computation. Scalar checking is based on the elementary principle that scalars, such as the magnitude of a vector or the angle between two vectors, do not depend on the coordinate system in which they are evaluated. In particular, a scalar computed from measurements in the body frame must equal that computed in any convenient reference frame. where tB is a tolerance parameter based on the magnetometer resolution and unmodeled magnetometer biases. must be greater than A^/12. 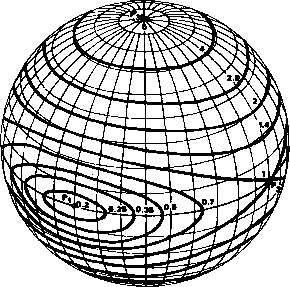 The residual error, 8B=(((AB)2)- X2/I2)l/2, in the IGRF (1968) magnetic field model has been shown to be less than 200 nT (Section 5.1) for intermediate altitudes of 700 to 800 km. Computed residual errors in excess of this value are indicative of unmodeled biases. 'Rigorously, the measurement BM is a true vector only if the magnetometer triad is orthogonal; otherwise, Bw denotes three ordered measurements which are treated algebraically as a vector. where SM and Sc denote the measured and the calculated Sun vectors and te is a tolerance based on the magnetometer and Sun sensor resolution, the accuracy of the field model, and unmodeled biases. An equation analogous to Eq. (9-27) may be used to obtain a measure of the relative Sun sensor and magnetometer alignment and the error in the model field direction. Expected root-mean-square (rms) residuals, due to Sun sensor and magnetometer resolution, will contribute a residual to Eq. (9-28) analogous to the X\/\2 term in the discussion following Eq. (9-27). However, this residual is highly orbit dependent and can best be established via simulation [Coriell, 1975]. Unmodeled rms residual angular errors in the IGRF reference field are of the order 0.3 to 0.5 degree (Section 5.1) at 700 to 800 km. when used with Sun sensor measurements. Ec is the nadir vector in inertial coordinates and cM and es are tolerances associated with the magnetometer and Sun sensor accuracies, respectively. Clearly, mean and root-mean-square residuals of scalar quantities are useful for assessing the magnitude of unmodeled errors in sensor data. Displays of predicted-versus-observed scalars are useful in identifying time-tagging or other systematic errors in the data, particularly before mission mode when tests based on an a priori attitude are not available. where the explicit time dependence of Bc and BM has been suppressed for convenience. The vectors BM are known from measurements, and the corresponding values of Bc can be calculated using spacecraft ephemerides and geomagnetic field models. Therefore, the values of Y(t,) corresponding to each value of BM can be calculated, and a least-squares fit of the data to Eq. (9-33) (see Chapter 13 and Gambhir, ) can be made to obtain the best estimates of the three components of b.